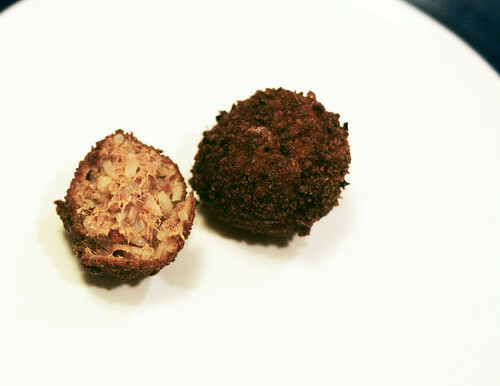 These are boudin balls. Boudin is a mix of pork, pork liver, and rice and herbs, spices, aromatics. I'm not sure what Rob of Butcher & Larder put in this batch, but I have to say this is just as good as what I've had in New Orleans. Boudin is essentially already cooked before it is stuffed into a sausage casing. And Boudin Balls are the most popular usage for this. You can remove it from the casing if you like, or you can keep it in the casing. But you dip rounds or balls of the sausage into egg, roll it in bread crumbs, and then deep-fry it. Took longer to mix up the breadcrumb mixture than it did to cook this. Combine the bread crumbs and spices. Dip the sausage balls or rounds into the egg. Roll the balls in the breadcrumbs. Heat the oil to 375˚. Deep fry the balls a few at a time just until they are golden brown, about 1-2 minutes. They'll darken as they cool. Place on paper towels to drain. Eat while warm.